West Croydon | Boy Mestizo: Hoy, London! 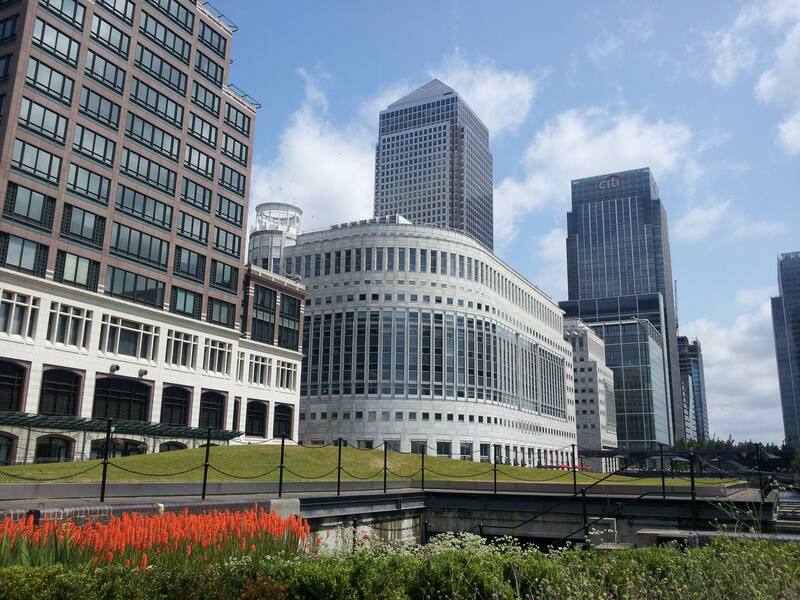 My team got moved down to Croydon in January this year – let me tell you this, it is a very different place from Canary Wharf. But whilst there aren’t that many suits and ties down there, there is still a Waitrose!! However, unlike a few of my colleagues, I was rather okay with the transition: I was rather familiar with shopping and eating in Croydon from my days living in Surrey, and my commute is now hella easy and crowd-free… and I suppose I was getting a bit tired of the samey-chainey food options in the Wharf (WASABI I HATE YOU SO MUCH). Sure, I would miss the lunchtime window-shopping, the glass-steel-marble skyscrapers, the preppy hot girls in their finest office wear, the… erm, prestige I guess of working in Canary Wharf? But hey, I love (re)discovering different parts of London; Croydon lunchtimes would therefore be fun times. Over the past few months I have therefore taken it upon myself to discover the best in lunchtime dining in Croydon – not just for my stomach’s sake, but also maybe for my career’s sake: I think I’m well on my way to becoming my team’s (hopefully indispensable) Food Guy. See below for the results of my exhaustive, scientific and completely objective study. Ah yes, good old Uncle Lim’s; I’ve known you for a long time. Cheap and cheerful Malaysian canteen that can whip up dishes fresh from the kitchen or, the more usual option for me, a selection of food from their hot counter, packaged into a Medium Meal Deal (rice/noodles, one meat, one veg, one drink) or their Large Meal Deal (rice/noodles, two meat, one veg, one drink). Portions are hearty (the Large will put you into a food coma. You have been warned), the prices are cheap, the turnover of the food is fast enough, and the quality itself decent for what it is. The Malaysian lamb curry may be a bit too bony and the salt and pepper squid a bit chewy, so I would go for the beef rendang (rich and flavourful but not too spicy) and the sambal aubergines – they are both delightful. The rice is soft and fluffy, whilst the noodles are a bit plain but more-ish in that “fried food tastes so good” way. 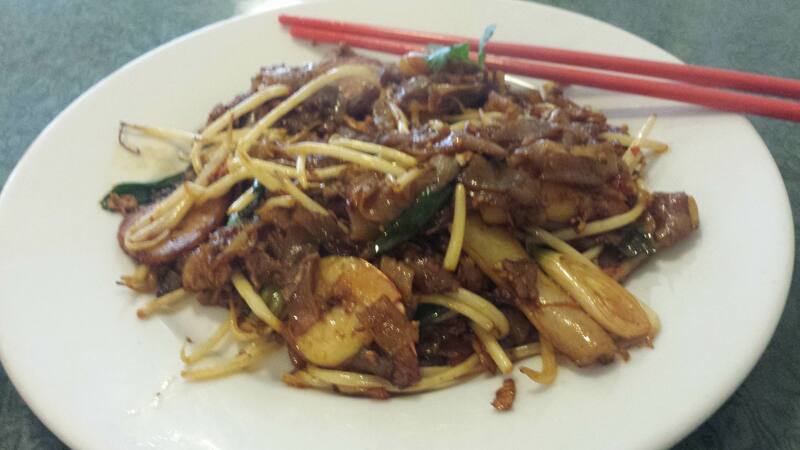 I also recently had the char kway teow; very generous portion and again very tasty. Rather surprisingly, the prawns were not the piddly kind you get in the supermarket, but more properly-sized beasts. Not bad for a canteen in Croydon! It certainly does not stack up against Satay House or Melur, my two favourite Malaysian restaurants in London, but then again Uncle Lim’s has no pretensions (and certainly not the prices) to be like them. This is a place for a filling and hearty lunch that delivers flavour, if not sophistication. I took my team’s business analysts here for lunch once; several have been back, including very recently for a colleague’s leaving lunch. If it’s good enough for them, surely it’s good enough for you? VERDICT – A good place. Let me make clear that this is not the height of fine Malaysian dining in the capital, but it’s not trying to be like that, and so cannot be rated in the same way. You want something different in Croydon? You want teh tarik? You want a hearty meal that delivers on flavour for a good price? Then Uncle Lim can feed you, and he will feed you well. I was rather surprised to spot these guys in the Allders mall: Indian street food in Croydon? Seems a bit too hipster for the area… but the more important question is – how do they square off against the currently on-trend Dosa Deli and Everybody Lovelove Jhal Muri Express (as if that’s even a legitimate question)? Regardless of who is making the wraps, they are tasty enough for lunch. The first time I went, I had the paneer tikka wrap: adequate amount of paneer filling bulked out by salad and a flavourful if mild tikka marinade/sauce/spice. I have since followed this up with other wraps, but the meat options present a rather unremarkable dining experience. The pakora were good and crisp and nicely savoury, if rather oily, but the samosa is a nice and fresh little parcel of deep-fried goodness (just about superseding my love of cold 85p samosas from the corner shops, the height of gastronomic experience). A further visit for a sit-down meal with mia madre saw us having the tandoori chicken – a succulent and juicy affair – whilst the lamb seekh kebab salad was… interesting in its combination of olives and sun-dried tomatoes with lamb seekh. The output is quick, the prices are low and the food is adequate. 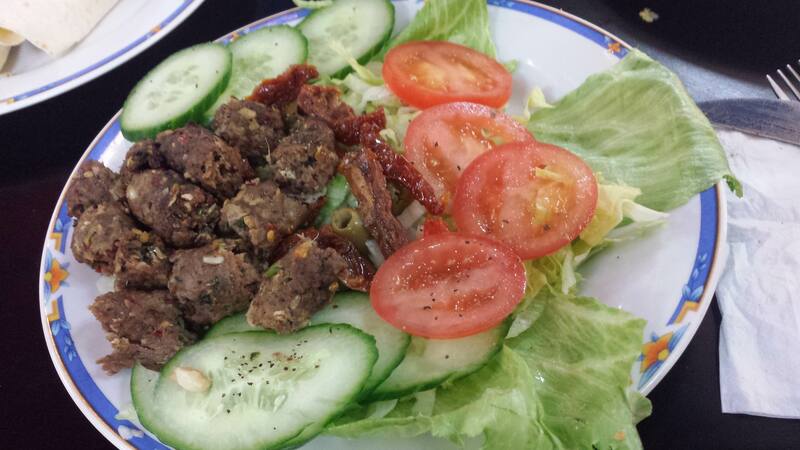 It certainly makes for a change from the normal wrap experience, not that there are many in Croydon. VERDICT – An okay experience. Dished out from the rough-and-ready stalls lining the passageway in the rather tired Allders mall, Chai Corner and Chilli Chutney’s food do an admirable job of bringing a different kind of Indian experience to town. It’s not particularly polished, but it ticks all the boxes for a decent and quick lunch. We’re getting into some serious lunch territory here. I’d initially spotted this little bad boy of a café back in December, on our team away day and Christmas lunch outing, and made a mental note to myself to check it out. Further research revealed some very promising reviews; Roti Masters moved high up my hit list. 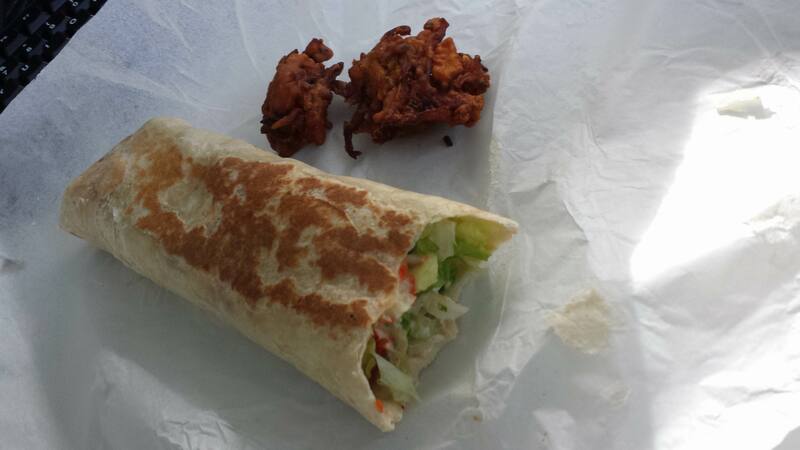 And who wouldn’t want to try a bit of Trinidadian roti wrap? For the uninitiated, these are a true fusion food from the Caribbean: Indian-inspired flatbreads (roti) filled with Indian-inspired curries using Caribbean meats, spices and ingredients… it’s a recipe for success, one that I hoped that Roti Masters would, well, have mastered (ha!). The proof of their ability is clear in the number of times I’ve been back: the man with the plan behind the counter now recognises me and has met my colleagues and even my dad and my mum – he now asks how the parents are doing! This is certainly one friendship I am happy to cultivate. 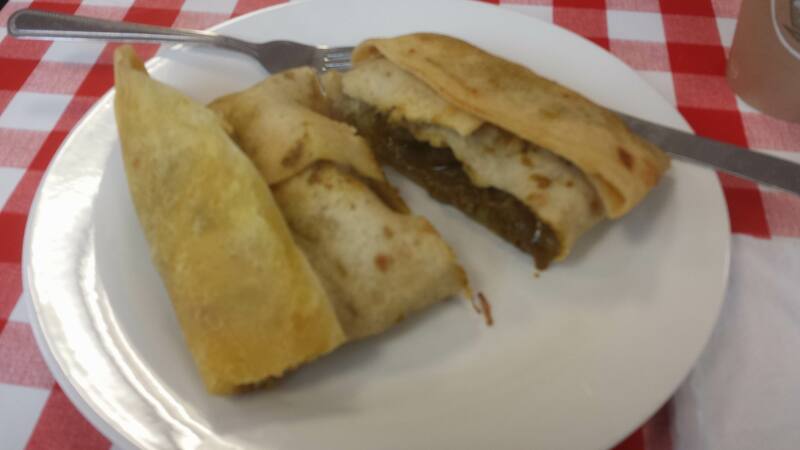 The Curry Goat Roti is a delight – succulent and tender pieces of goat in a highly-spiced and rich sauce, packed into a light and fluffy roti along with a myriad of other delicious fillings inside the light and chewy roti skin. 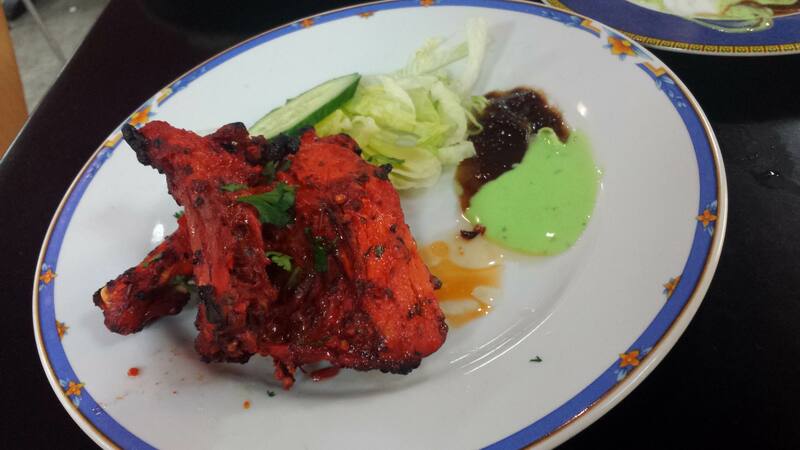 Although it looks small on the plate, first impressions can be deceptive; this bad boy will fill you up. The saltfish version of the roti is also very tasty and savoury, but I do understand that saltfish can be divisive – however, this is not too salty, so it’s definitely worth a spin. Enter email address. Get updates. Magic!